I've been a fan of Axiom racks for a long time. While they're not high end rack bling, they are well made quality racks rated for lots of weight at half the price. In addition, I've always liked their mounting system, which uses nifty mount points with nice looking rods rather than those flat attachment things. I'm also a fan of full fenders. 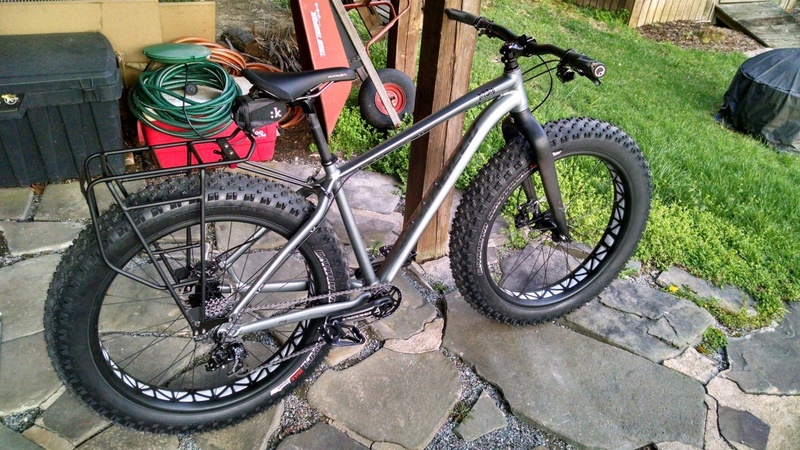 On my new Fat Bike, I will have both. 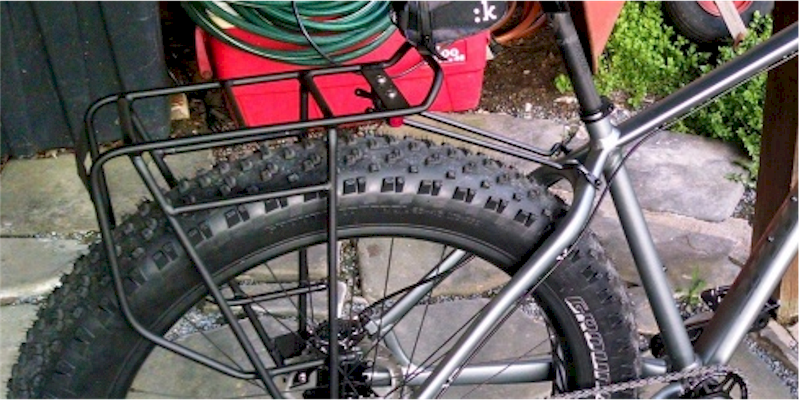 The thing is, the Axiom Fatliner rack I've bought and really like would interfere with the future fenders, which are on their way. 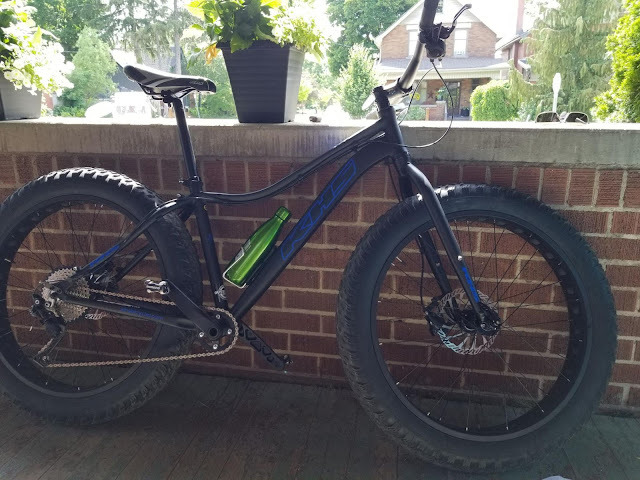 This isn't my bike, but here's how an Axiom Fatliner would normally be installed. As you can see, there would likely be a problem mounting fenders to the seatstay bridge; the rods get too close to the tire. To future-proof for my bike's fenders, I sacrificed a little bit of deck space (my panniers will be carrying all I need usually anyway) and moved the mounting post anchor things up top. TaDa! Future Fender Funkily Facilitated! 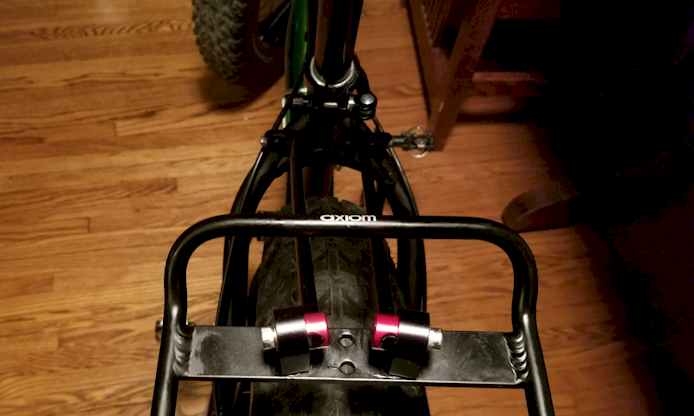 On a related note, I used the rear quick release skewer as the lower mounting point, leaving the frame mounting points for fender stays. This suited me extra fine because this method got the rack as low as possible. I have yet to see if the fenders I've ordered will go on easily or present me with problems. Stay tuned, dear reader, god knows I will feel the need to bore you with that next. PS - I have received nothing from Axiom or anyone else for this blog post. I just like Axiom racks.